The photographs included in Sarah Hobbs’ Psychological Traces, currently on view at the Indianapolis Museum of Contemporary Art, depict interior spaces that tell a psychological story. The conceit of these photographs is to give insight into the psychology of a room’s decorator (and implied occupier), who, though absent, has left some significant trace of an interior compulsion or quirk. 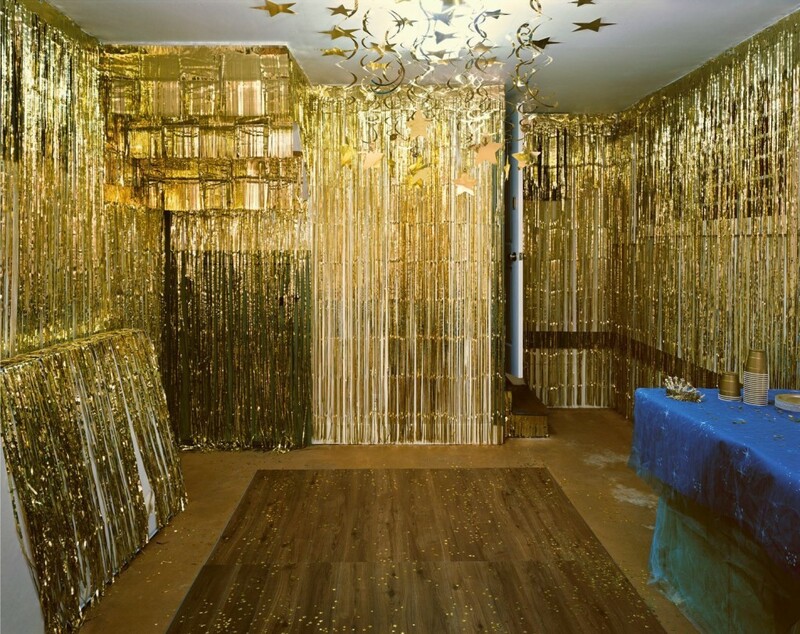 Prom Forever, Sarah Hobbs at the Indianapolis Museum of Contemporary Art, 2017. In weaker works, this can tend toward the cartoonish. 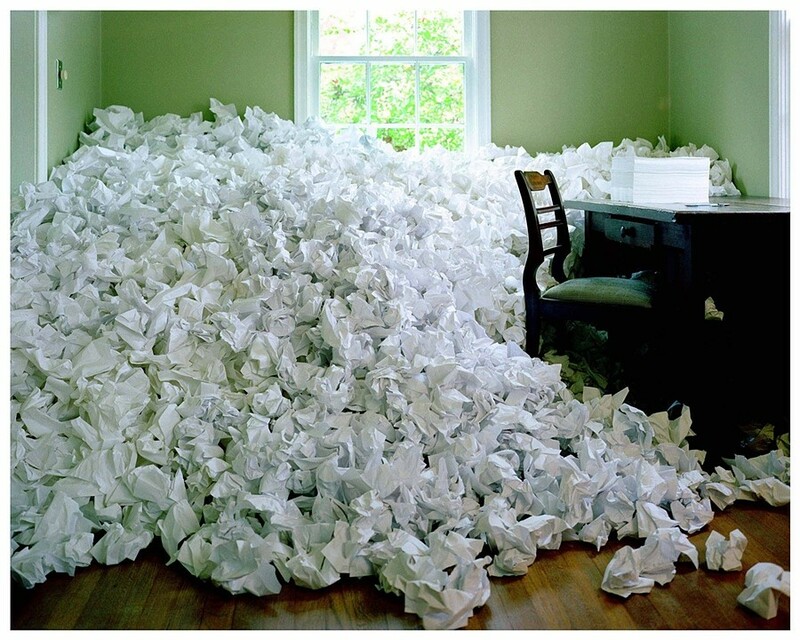 In Untitled (perfectionist), for instance, a small room with a desk, chair, stack of paper and pen is filled chest-high with crumpled-up sheets of paper. The idea here is all too clear, and little details like the lack of any visible writing on the paper make it feel theatrical and false, related to the idea of perfectionism without any of the pathos. The stronger works push past the level of architectural emoticons into the incredibly weird territory at the intersection of domestic work, dream homes, the interior decorating industry and the psychology of performing any task in the modern world. The images are loaded with all kinds of everyday associations, so it is not surprising that the photos began to unwind for me while doing a very ordinary, everyday stay-at-home dad task: cleaning the apartment which I share with my wife and three young children. Sarah Hobbs, Untitled (perfectionist), chromogenic print, 48” x 60”, 2002. Courtesy the artist. Somewhere between the eighty-seventh trip across the house taking things on the floor to their various belonging-places and dumping out the clean laundry on the bed to fold it, the usual despair set in. Is it really worth it to finish this? Why am I doing all this work? I realized that this is critical for the photographs in Hobbs’ show that were working, because they take place at precisely this moment. It’s a critical moment for any task I’m working on, although it feels more pressing in the domestic chores and projects for which I don’t get paid. 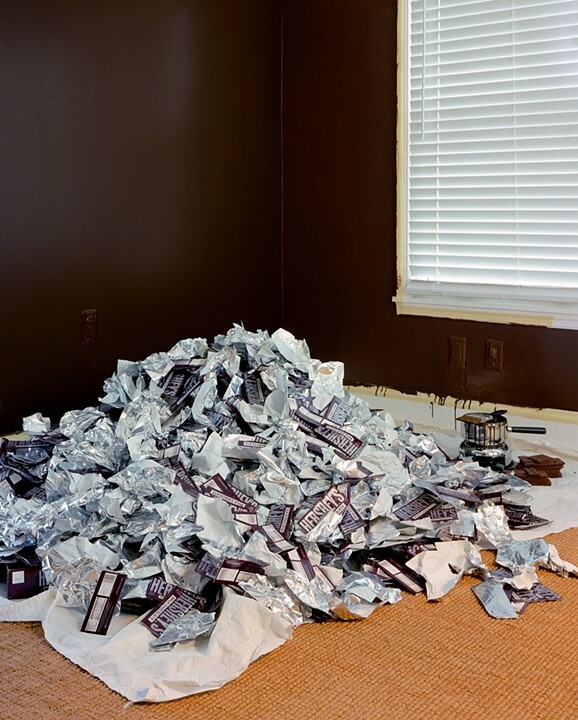 In Untitled (obsessiveness), the pile of Hershey’s chocolate wrappers in the center, with a melting pan and paint brush in the background, tell the story of how the decorator arrived at that rich chocolate color on the wall. But none of the cleanup has been done: chocolate wrappers are piled on the floor, the trim is still masked, and drips here and there need to be cleaned up. It’s as if the prospect of cleaning up after the project has forced the decorator to confront the fact that the walls really are chocolate now, causing a temporary paralysis. Sarah Hobbs, Permanent Marker (occupied bedroom), chromogenic print, 48” x 60”, 2015. Courtesy the artist. Permanent Marker (unoccupied bedroom) depicts what seems to be an aborted attempt to color an entire room black with permanent markers. Having mostly covered the walls, and started on the bedspread and headboard, the coloring has stopped, the floor littered with markers. Perhaps exhaustion or fume inhalation caused the stoppage in this case. In Untitled (indecisiveness), the walls of the small room are covered in paint sample cards, a chair in the middle to think about which color to go with. This decorator has been diligent enough to consider all possible options, which is such an accomplishment that the next step of making a choice is, perhaps, unbearable. While slightly different in each case, this pause or stoppage at the moment when the usual despair sets in, allows the photographs to question themselves: to ask, with the viewer, what is all this work for? Is it really worth it to finish it? The sheer strangeness of the projects makes answering these questions harder than it usually is, and opens up the “What is it all for?” question in surprising ways. Untitled (obsessiveness), chromogenic print, 60” x 48”, 2003. Courtesy the artist. As an example of this questioning, let’s dwell for a moment on Untitled (obsessiveness). If I ask, “Why paint the walls chocolate?” I should be prepared for the obvious reply: “Because I love chocolate.” While this answers the question, and makes some sense of the action, it seems somehow insufficient for the weirdness of the actual chocolate paint. But if I ask, “If you want a chocolate room, why not just paint the walls with ‘Bitter Chocolate’ colored paint,” it should perhaps strike me as strange that Sherwin-Williams in fact produces a paint color named after chocolate. And if I ask, “If you want a chocolate room, why not buy a ‘Chocolate Layer Cake’ scented candle,” it should give me pause that the Yankee Candle Company does, indeed, makes a candle that smells like chocolate. Or If I suggest just keeping a bowl of Hershey’s Chocolate Kisses in the room, I might start to wonder why this chocolate drop is marketed as a substitute for affection. In fact, the more alternatives to the drastic act of painting a room with actual chocolate I reach for, the weirder the world of chocolate and chocolate-themed marketing reveals itself to be. So why is it perfectly normal (sensible, even) to design, market, and manufacture home decor products with a chocolate theme, if the genuine “chocolate room” these products evoke is weird, verging on creepy? There is no easy answer to this question; the reason why is buried somewhere in a gooey slop of psychological manipulation, marketing schemes, home decorating shows, and the ugly sides of industrial chocolate production. As a result, the psychological piquancy of the works achieves its urgency through the contradictions and schizophrenia of the cultural systems surrounding the ways we make homes for ourselves, allowing larger cultural resonances to emanate from these small, private rooms. Sarah Hobbs: Psychological Traces at the Indianapolis Museum of Contemporary Art runs through June 24, 2017. March 14, 2017 | Filed under Art Seen: National and tagged with Brian Prugh, iMOCA, Psychological Traces, Sarah Hobbs.